Four games into the season FAU’s run defense can be regarded as the achilles heel of the team. Last week the Owl’s gave up 296 rushing yards and four touchdowns to Middle Tennessee State in an overtime loss. Defensive coordinator Pete Rekstis is expecting to see more of the run on Saturday when FAU travels to Rice, which means gap control and containment will be fundamental. FAU ranks near the bottom of Conference-USA in rush defense, having allowed an average of 219 yards per game while Rice leads the conference in rushing. Rekstis believes that there are some parallels between what FAU has seen this season and what they will face against Rice. Rice is led by senior running back Charles Ross, who tips the scale at 6-foot-1, 235 pounds. FAU has yet to see a running back like Ross this year, or a spread offense that features a bruising run game. Rekstis attested that the key for FAU to stop the run will be to not miss tackles and play assignment football at the point of attack. 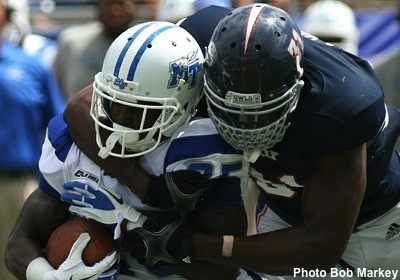 FAU was primarily in a nickel package against MTSU due to the spread attack, which allowed for the Blue Raiders’ running backs to often reach the second level of the defense. Rekstis is hoping to incorporate more of a 4-3 look against Rice, which would put senior linebacker Randell Johnson on the field. Johnson played sparingly last week and finished with just one tackle. “We’re trying to find ways to get Randell [Johnson] on the field when maybe the personnel group doesn't lend to that,” Rekstis said. If FAU looks to stay in the nickel on passing downs, Christian Milstead is slated to be the extra defensive back. Milstead was the nickel last week, and finished with a career-high six tackles. Rekstis hinted that Milstead has been a solid contributor and earned playing time over usual nickel Cre’von LeBlanc.